Tasting notes are the hardest thing for me to write about wine. I have strong opinions about the elements of a good tasting note. But while I love a good argument, I have stayed out of this one because I don’t feel comfortable telling other people how to write them. The most successful and popular tasting notes in the world are Robert Parker’s. They’re not how I like to write. But telling beginning writers not to emulate Stephen King is silly. Moreover, we don’t all think the same way or taste the same way. So why would we all describe wines the same way? I worked for a while with a chef turned writer who has one of the best palates I know; more acute than mine. She can taste an unsuccessful recipe and instantly analyze how to fix it. I trust her taste in wine, especially in the difficult task of trying not to miss the subtleties of the 40th wine of the day. But (I hope she’s not reading this) she’s not a vibrant writer; her tasting notes tend to be a collection of the many subtle flavors she detects. I don’t taste all those flavors, but I don’t doubt that she does. Who am I to tell her what to write? The New York Times wine critic Eric Asimov makes some great points about tasting notes in his new book, “How to Love Wine.” He has irritated bloggers by telling them to not write tasting notes at all. But that’s not really his point in the book. His point is that the notes that tell you the most are not about the fruit, but about everything else: the texture, the freshness, the body. Asimov’s right: who buys a wine because it’s described as tasting like peaches instead of apricots? But there is a difference between red fruit and black, or stone fruit and citrus, and that’s information worth knowing. Here are my goals in writing a tasting note. If I have only two sentences, I want to use one to tell you where the wine came from, and why it tastes like it does. But I don’t expect my readers to know what “calcareous soil” means. If the dirt is key, I have to spend the space to explain why. Same thing with winemakers. I try not to name-check someone without saying what their style or background is. 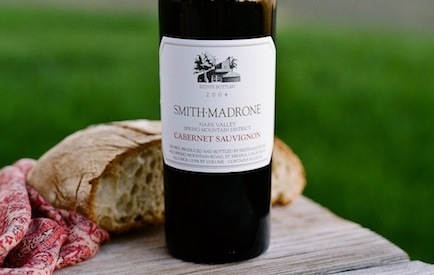 2) A succinct description of the most notable flavor and aroma characteristics of the wine. This is harder than it sounds, especially when writing a lot of notes about the same kind of wine. Try tasting 20 Chardonnays in a row some time and not saying “rich body yet balanced with citrus fruit and some toasty oak” over and over. This point is the crux of a good tasting note. The context sets the stage, but people do want to know what the wine tastes like. I don’t want my notes to read flabbily. Muscular writing verbs its way into your brain. I came, I saw, I drank the wine. Tiresome writing has more nouns and adjectives. “Lean, crisp and wonderfully scented, the delicious wine has aromas of grapefruit and wildflowers.” The sentence is descriptive, but it’s flat. You can get away with one, but several in a row will exhaust the reader’s brain just as a high pH wine tires your palate. Yet it’s really hard to use verbs in tasting notes. What does wine do? It runs down your tongue and into your throat, unless you spit it out, and nobody wants to read about that. The flavors don’t do anything: they just are. Do berries really burst from the glass? Do flowers fill your nose? This is one of my greatest struggles: not just to capture the taste sensations of the wine, but to do it in an interesting way. 4) An honest appraisal of where this wine fits in the spectrum of all wines and of wines of its type. If I visit Chablis, all my notes sound similar. The 100-point scale rating, published or not, reminds me weeks later which wines I liked best. I know a few writers who oppose the 100-point scale, yet use it in their own notes. It’s even more important for red wines that can have some funkiness, like Pinot Noir. If I just read descriptions, I’m drawn to the wine that sounds the most complex. But sometimes a fresh, bright, straightforward wine is more pleasurable. One thing I dislike about the media world is that writers are rewarded for overstating the greatness of whatever they’re writing about. Editors will tell you, “If it’s not great, why are you writing about it?” Food writers play this game all the time, writing effusive paeans to fairly ordinary products in order to sell a story. And let’s go back to Mr. Parker: he’s successful largely because he makes one-dimensional big-bodied wines sound like amazing, multi-layered, unforgettable experiences. It’s another reason I struggle with tasting notes. Let’s be honest: the majority of wines these days are in a narrower range than we admit, good under the right circumstances, but not life-changing. Kermit Lynch once wrote of a wine, “A mouth rinse, for when you need one.” I know exactly what he meant, but editors don’t want that, and neither do most readers. Add those four goals together and that’s a lot of pressure for tasting notes. It’s why I struggle with them: to me, they’re not just a list of flavors. They should tell an entire story in a short space. 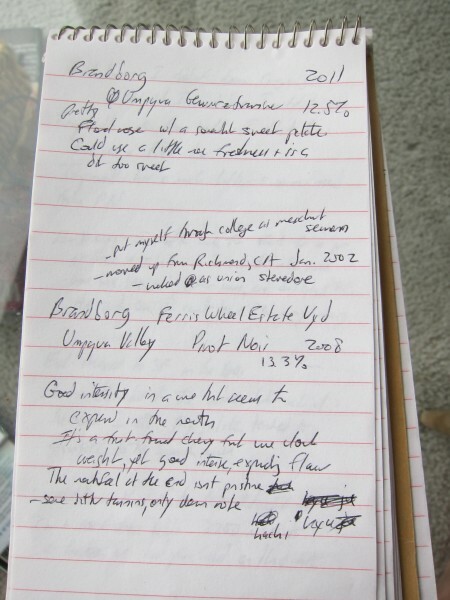 I write a few hundred tasting notes a year and I think I achieve my own goals maybe 10 times a year. This is why I don’t want to tell other people how to write tasting notes. I’ve done thousands, and I haven’t mastered it myself yet. Frankly, I’d give myself about an 85. Or, on the Wine Advocate scale, a 91: my notes are acceptable for daily use, but not exciting enough for special occasions, though there are times when they’re multi-layered blockbusters that burst from the page. This is a great and informative post. What a lot of people don’t seem to realize is that criticism is a genre, and tasting notes are like an extremely brief form of criticism. In my opinion, the vast majority of tasting notes are not done particularly well for the reasons you outline above, namely, that they are boring and repetitive. And while it is true that a tasting note needs to be descriptive, it also needs to be *engaging*, especially if one is purchasing a bottle that it totally new. Of course, a lot of consumers choose based more on varietal than on anything else, but I admit to being influenced by tasting notes. I also will admit to, ahem, noticing 100-point scales, but I wouldn’t say I’ve ever made a purchase based solely on the score. Anyway, an great post – thanks. First if you learn a systematic approach to tasting wine like the WSET system you then learn to do quality assessments that include the important positive features of a wine, which without the 100 point scale give a good assessment of the wine for future reference or others to use, but number 1 you need to trust the palate of the person you follow for advice. I’ll admit that the reason I don’t publish tasting notes is pretty much because everyone else does — what do I have to add? — but also because it’s hard. I write copious notes for myself while tasting, the most important elements of which are suggestions for what I think I’d cook to go with the wine and whether or not it earns any special approbations: “yuck,” “eh,” “yum,” “really yummy,” “wow,” and so forth. But, deep down, I have a weakness for the old-fashioned character-based tasting note that anthropomorphizes the wine: “a flamboyant Cabernet, serious but not stern, screams black currant and tobacco but leaves quietly.” I’ve heard much criticism of such notes but, for me, they create more useful pictures of a wine than a list of flavor notes. So, Blake, may I ask what you think? I don’t think you understand the WSET systematic approach, it has a quality assessment that you can get as florid and descriptive as you want, it’s not taught at level 1-2-3 you have to be in the Diploma level to learn it and understand how to use it. I believe a systematic approach is the only way to review a large number of wines (or a single wine) and be able to assess quality at all price points. Great post, Tom. I’m glad to read that your greatest struggles are also mine! And I agree totally with @Erika. Honestly, I don’t like wine tasting notes. At all. Never read a memorable wine tasting note! I wrote for italian wine guides during years, and I’m bored to the point that I stopped attending the tastings. To taste dozens and dozens of wines in a same day, trying to write interesting tasting notes for each of them…well, it’s engaging like to turn bolts in a assembly chain, if you know what I mean. Thanks for an interesting article. This may be irrelevant, but did you really mean to write that high pH wine tires the palate? In my experience it is the extreme wines that makes you numb, wines high in acidity or in tannins or especially in bitterness. Or have you discovered something about low acidity wines that I have not? Ake: High pH wines — wines with low acidity — tend to fatigue your palate after a glass or so because they lack the chemical structure to cleanse your tongue. They’re like butterscotch vs. lemon cream, if you will. I’ve never had a wine so high in acid that it made me numb. Did you know Coca-Cola has a lower pH (about 2.5) than any wine out there? And it’s the pause that refreshes. Some very good points. When I first started writing notes I tried to capture all the subtle flavors I experienced. But didn’t find this useful because the next time I drank a bottle some of the flavors didn’t always emerge. I find it much more helpful just noting red vs black vs blue fruits, citrus vs tropical, and what sort of ripeness, body, mouth feel; and fullness of tannins, acidity and mid palate fruit I experience. Keeping it high level is much more helpful when I select the next bottle to get a feel for how it may have evolved and be fairly sure of what to expect in that bottle. I think when others read your notes that it’s more helpful this way, particularly when they don’t experience the same flavors. Nice work – thoughtful treatment of the subject. or at large outdoor concerts like 98Rock’s ‘Worlds largest BBQ’ or Livestock. 3. Cartrol [less common] Penetrex [less than 1%]. a topic that has been discussed for many years. I’m really enjoying the theme/design of your web site. Do you ever run into any web browser compatibility issues? or line braces for your teeth for enamel alignment. such a program in contrast to classic orthodontics. some individuals made our minds up in opposition to Invisalign braces. your teeth compared to standard line tooth braces. else will know that they have even braces throughout whatsoever. any the teeth place carried out is simply because from the considerations they have regarding physical appearance, and the effect this will likely placed on their own self-confidence. deciding on Clear Braces Dentist in Derby. be designed specifically by way of a pc using personal fact models. nevertheless just what of the opposite side of the cash? system your need to have a good deal of self-discipline. seedling bun or even peanut butter sandwich without regretting this all day afterwards. you could end up having to start off the procedure all over again. If you aren’t great along with self-discipline, then you’ll need to think for a long time with regards to choosing Invisalign tooth straightening system. samba dance, and scrumptious African-motivated cuisine. conflicts before you run out of money. His team stood a frustrating fourth position of their group so that they are not likely to reach the optimistic playoffs. of computer aided graphics design software (CAD). a superb article… but what can I say… I hesitate a lot and don’t manage to get anything done. Hi, this weekend is pleasant in support of me, because this occasion i am reading this wonderful educational article here at my house. therefore it’s nice to read this webpage, and I used to go to see this webpage all the time. Hi there, I do think your website could possibly be having web browser compatibility problems. still did not materialize, including a shot that hit the crossbar. tickets now, and increase with all the relax of The Atlanta area Falcons fans to success. Make sure that most of the first points of experience of prospective employers are proper. specialist handle? If perhaps not, now is the time to assume a much more adult name. Avoid usernames including unflattering language, mis-spellings and negative words. targets It is good. Make a plan and goal to get a particular amount of job search activities weekly. and it will increase your probability of happening more job interviews. Whether there are any problems you’ll on average be questioned. will need to understand ought to be asked. Update your style every five years to keep current. higher than the 20-period upper Donchian Band. Form dedicated fusion band, it shifted towards spiritual music. and Y is out Now. We don’t have words to describe how awesome this game is . I think the admin of this site is truly working hard for his site, since here every material is quality based material. There is no better diet pill available legally. The initial step towards a brand new figure may be the change of a person’s diet. and customer support is of low quality. After exploring a few of the articles on your website, I really appreciate your technique of blogging. Try putting quotation marks around the person’s first and last name and search again. Why Would Anyone Need To Find Names By Cell Phone Number. software you tend to lose this. calculator, and clock. It is a way to restrict them from bad friends’ relationship and continue them indoor. writing to take facts about my presentation topic, which i am going to deliver in academy. along with your permission allow me to grab your feed to keep updated with forthcoming post. I thought this publish was once great. I do not recognise who you are but definitely you’re going to a famous blogger should you aren’t already. take care of dry or cracked skin in your feet. Dry feet are brought on by too little moisture in the skin. The skin on our feet is naturally dry, as opposed to the skin on the rest body. the situation is a lot more frequent amongst seniors and diabetics. spending too long in the sun. the skin around the foot thickens in response, and offers a virtually waterproof covering. As a result, the feet can rapidly grow to be dry, rough and calloused. outer edges of toes, the ball from the foot as well as the back of the heel. points exactly where there’s a whole lot of repeated rubbing for a lengthy period of time. that may possibly feel bumpy. buffing pads that will give your feet the right finishing touch. Skin shavings gather in the in-built storage tray, so there’s absolutely no mess. solution is the distinctive micro crystals and super smooth rotating head. skin giving fresh breath to each of the blocked pores. to the smooth finishing they give your foot. integrated within the pedi pro package. gently, removes dead and hard calloused skin, although exfoliating and rejuvenating your feet. stepped out of the salon. to your blog. Online users already spend most time on Facebook (approximately one hour an average of). Utilize Facebook to improve your volume of friends list while building sales volume.